Colorado Peak Politics | BLOOMBERG AGAIN: Colorado Springs and Pueblo Have No Roads? BLOOMBERG AGAIN: Colorado Springs and Pueblo Have No Roads? What do you mean Colorado Springs and Pueblo have roads? Has Bloomberg ever been to either Colorado Springs or Pueblo? While neither are anywhere near the size of New York City, neither town is exactly…rural. Colorado Springs is actually the second largest city in Colorado. Further, according to Colorado Springs’ city government, “the City’s Streets Division is responsible for servicing over 7,431 lane miles of roadway, extending over a 194 square mile area.” And what about Pueblo? According to its city government, it has 1,200 miles of roads, thankyouverymuch. But, this isn’t about technicalities. This is about a mindset. Michael Bloomberg, with his nannystate ways, thinks he knows better than Coloradans, and this statement proves that he has no idea what he’s talking about when it comes to Colorado. Even worse is his condescension of the will of the voters in Colorado Springs and Pueblo. The recalled Senators represented the worst in our legislative system – members who placed the priorities of special interests before the will of the very people they were meant to represent. But what’s truly terrible is that Governor Hickenlooper has absconded his responsibilities as Governor to a man who is so dismissive of Coloradans. Having been born and raised in Colorado Springs, I recall huge patches of asphalt and concrete around the city upon which cars, trucks, motorcycles, bicycles and yes, sometimes, horses, moved from one place to another. We called them streets, highways and, yes, I recall the term 'road'. Even narrow patches behind houses and connected to the larger patches existed and were called 'alleys'. 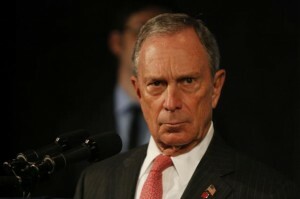 Come West, Mayor Bloomberg, come West and see our advanced civilization. More than a century ago, Colorado was settled by pioneers who drove their covered wagons on dirt roads; we've moved a little beyond that, Mister Mayor. And this is why you craven local politicians should wise up. Your political master bloombergnapolean will spend your carreers like Kleenex. Apparently we here in the springs are roadless hicks so of course we got rid of our enlightenment elite morris we're iliterate hillbillies without roads.